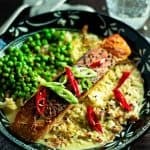 Salmon curry in a hurry is a simple and easy Thai salmon curry recipe made with coconut milk green thai curry paste. 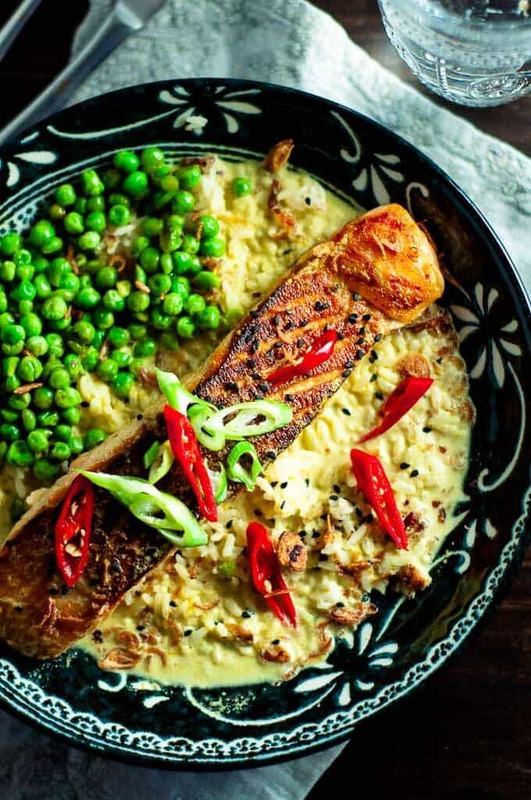 It’s perfect for midweek dinners, packed with heart healthy crispy skin salmon, rich creamy curry sauce and crunchy fried shallots, sesame seeds, and sweet juicy green peas. Ok, so I’m gonna say it. Yes, this is fish and rice with sauce. But, it’s not just any old fish and rice. ◊ It’s a super basic spicy salmon curry in a hurry recipe, that is super easy and super tasty! 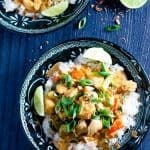 ◊ It’s a curry for lazy people, busy people, or both, who love a quick and simple curry mid-week without having to go down to the local takeaway. ◊ This curry is light. It’s healthy. It’s Simple. Its Tasty and Its quick. 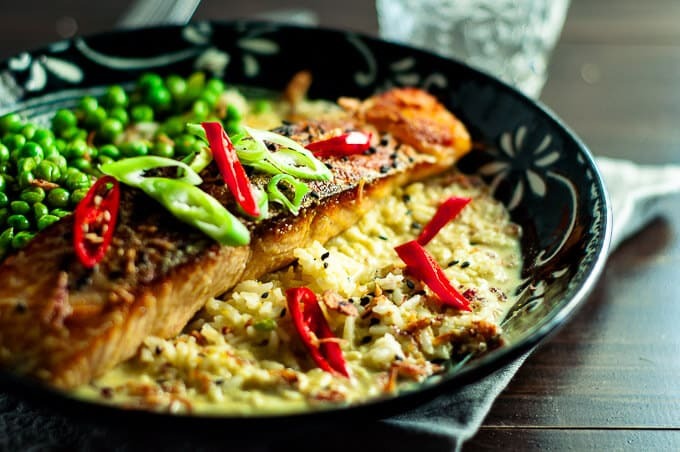 Good quality salmon, rice of your choice, coconut milk, green thai curry paste, fish sauce and lime juice. It’s backed with good omega 3 fats, and you can add in your favourite veges for even more added fibre. Green peas, broccoli, beans, carrots are all great options. Even frozen diced veges would go beautifully. The trick with this curry dish is getting the salmon right – crispy, but not burnt, nicely blackened without the charcoal! 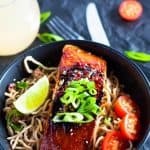 It’s actually pretty easy and not that different form how I cooked this Chilli Soy Salmon with Sesame Noodles. Pat the salmon dry with paper towel to remove excess moisture. Heat a pan or skillet on medium to high heat and lay the salmon flat side down. over with a lid and cook for 3 to 4 minutes. Salmon should be nice and crispy and golden brown. Which Curry Paste Is Best For A Spicy Salmon Curry? For this salmon curry in a hurry recipe I used the “Volcom” brand of green thai curry paste which I love. Green curry paste is not super hot, but not super mild. I think it’s somewhere in the middle of curry pastes, although depending on the amount you use you could make this either a medium curry or a mild curry. 1 tablespoon of curry paste would result in a mild curry. Equally though you could use red thai curry paste. Volcom also make that version. Can You Use Coconut Cream in Cream in a Salmon Curry? I would not use coconut cream as it would make the curry to thick. Using coconut cream allows you too get that luscious, almost velvet curry sauce that’s not too thick and not to thin. What about Light Coconut Milk? Sure, you could use the light coconut milk, but the curry sauce would be runnier, maybe more soup like as opposed to curry like, unless you used a thickener like cornstarch. A thickener though would start to take away from the intense curry flavour. Looking to make something with leftovers you can take to work the next day? 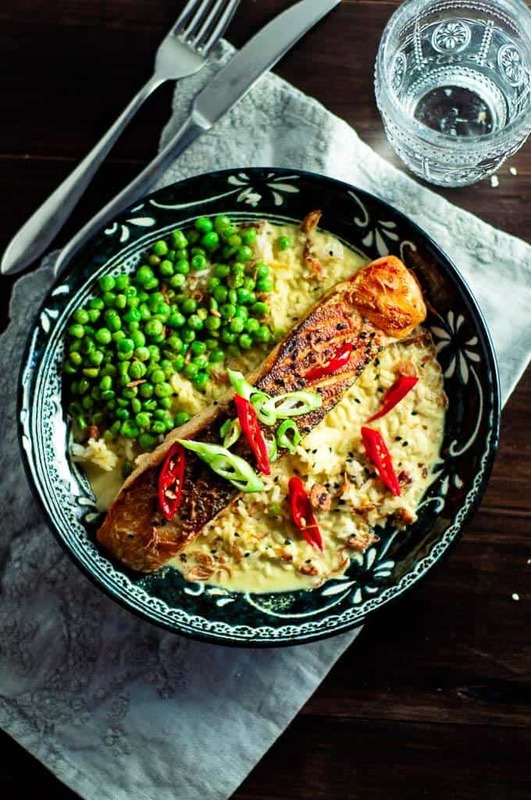 This is salmon curry in a hurry recipe makes for great leftovers. I always make an extra portion for work the next day. It’s as easy as storing it overnight in an air tight microwave safe container and when you’re ready for it the next day, microwave for 2 to 2.5 minutes and lunch is sorted. This is one of those easy salmon recipes I love because it’s just so quick to pull together. 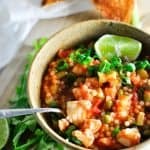 I always tend to have salmon portions frozen in the freezer, rice, curry paste, coconut milk, fish sauce and bottled lime juice in the pantry so this is a perfect recipe to have in your back pocket when you’ve got nothing planned for dinner, or you know you’re going to be home late but still want a clean healthy dinner. More Salmon Recipes >>>>> This deliciously addictive Salmon Burrito Bowls recipe, this salmon with leeks and lentils and my Spicy Salmon Stirfry that will get your tastebuds dancing. 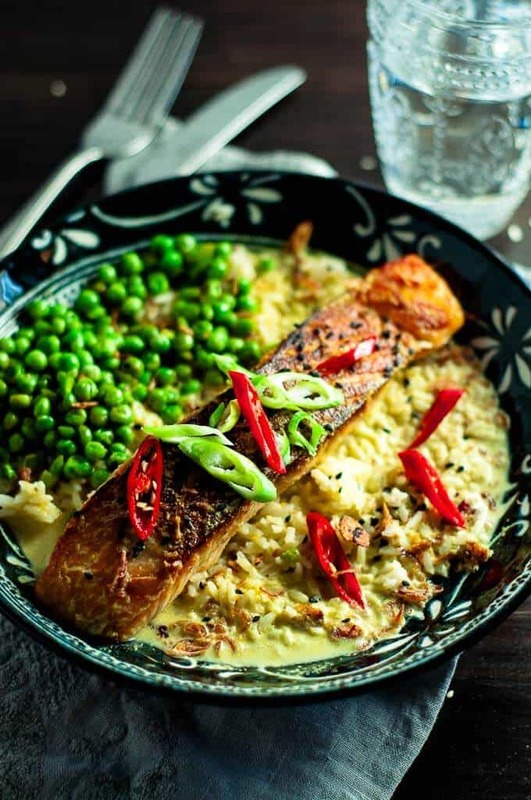 Salmon curry in a hurry is a simple no nonsense dish, perfect for midweek dinners, packed with heart healthy crispy skin salmon, rich creamy curry sauce and crunchy fried shallots, sesame seeds, and sweet juicy green peas. Rice: Boil rice to packet instructions. I do mine in the rice cooker – 1 cup to 2 cups of water, and press the cook button which goes for about 20 minutes. Heat a frypan on high and place salmon flat side down in the pan. Put a saucepan lid over the frypan and let salmon cook on one side for about 5 to 7 minutes . After 5 to 7 minutes turn salmon and cook on the other side for another 5 to 7 minutes, covered again with the saucepan lid. Curry Sauce: Whilst salmon is cooking, heat a non-stick saucepan on medium heat and add the curry sauce. Stir for a minute until it becomes fragrant. Add in the coconut milk and stir until it is combined with the curry paste. Add the fish sauce, lime juice and salt and stir to combine. 1. Start cooking the rice first, if using a rice cooker, or if you’re cooking it on the stove. If you’re using one of those instant packets of rice that you microwave, obviously you can do that last. 3. I like to serve up my Salmon Curry In A Hurry with some sesame seeds, dry fried shallots (available from Woolworths), and fresh chilli for extra bite! Yes it is super tasty! I make it at least every couple of weeks. It’s one of my go to dishes for easy weeknight meals.